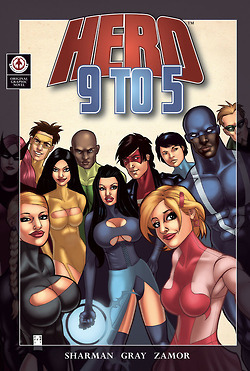 Not sure if you want to pre-order Marksosia's Hero: 9 to 5 - Quietus because you haven’t read the first book? You want to read the first book but for any one of a million perfectly legitimate reasons you can’t buy a copy or legally download it? Then you can always download a pirated copy here. Yes, you read that right. Creator Ian Sharman has published a link to illegally download his work. "Shocking, eh?" challenges Ian, Managing Editor of Orang Utan comics, on his tumblr. "But, hey, you have Google, you could find it anyway, if you really wanted. And if it persuades just one of you to pre-order the new book then I think it’ll be more than worth it. And, hey, maybe some of you will love it so much you’ll want to own a copy." So, once you’ve read the first book, how can you pre-order the new book? 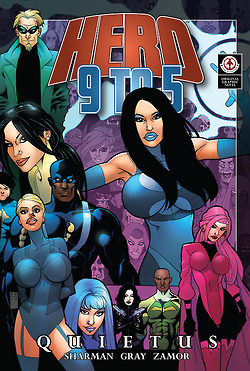 Well, you have until 18th May to pre-order Hero: 9 to 5 - Quietus from your local comic shop. If you want a copy then please don’t just assume your retailer will order it in and you’ll just be able to pick it up when you see it on the shelf in July, because odds are that you probably won’t. If you want it, pre-order it. 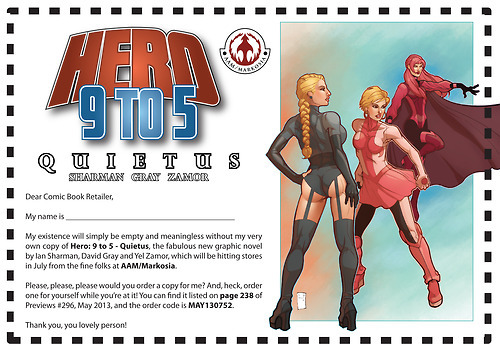 To aid you in this, here’s a handy form that you can print out and take along to your local comic shop. It includes all the details that they need to order the book for you. It’s as easy as that.